We knew that the day we planned for a soccer game would be crazy. We prepared accordingly the night before with what has been the best tasting and the best value sit down restaurant we’ve been to in Buenos Aires (BsAs). 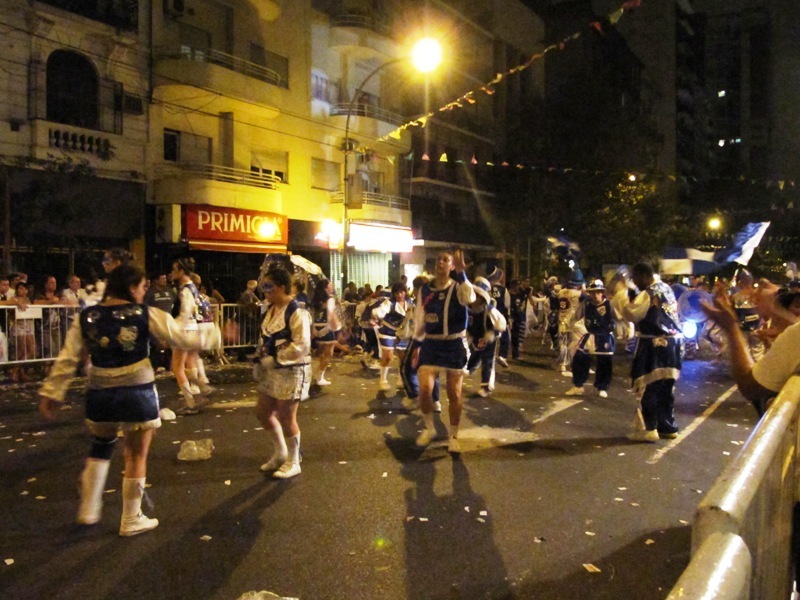 Cumaná is located in the Recoleta neighborhood just north of central BsAs. 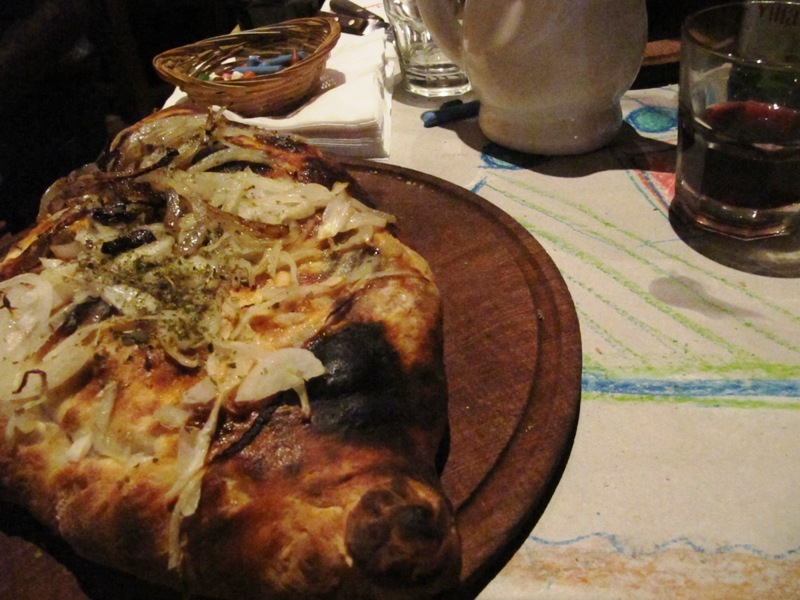 We had the tripe stew and a mushroom calzone that was so phenomenal that we are planning our tourist sites in the neighborhood so that we can go again. The calzone was crispy and soft with all the right mozzarella goo that you expect. Topped off with a house malbec served in a penguin-shaped carafe and we were happy travelers. The whole meal cost about $25 USD. The next day we grabbed some amazing pastries for the road from a bakery down the block from our apartment. 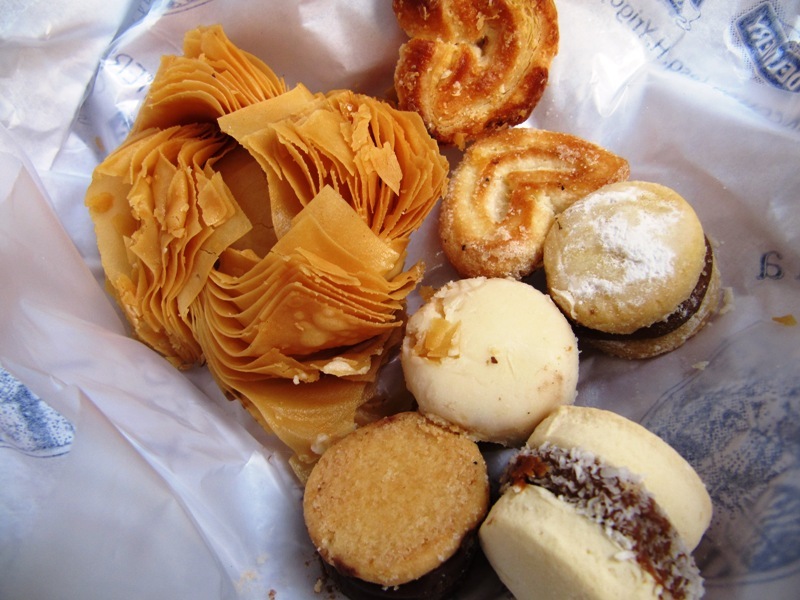 We bought several types of dulce de leche stuffed alfajores (the cookie sandwiches), pastel de batata (crispy filo with a sweet potato filling) and some orejitas (the heart shaped ones). Carmen and I really wanted to go to a few soccer games while in South America. Our ideal was to go to the stadium, buy tickets and return a few days later to our seated section. This plan quickly proved to be much more difficult than we’d imagined. Time and time again the locals we have met informed us that not only is there a chance of getting robbed, but at the game we might unwittingly find ourselves in the middle of a fight started by crazed team hooligans. Instead we decided to go with an organized group that bought the tickets, then chaperoned a group of 40 or so other young world travelers to great seats on the upper mezzanine. The cost of this was about $95 per ticket which included round trip transportation. On our own we would have spent $70 each with taxis with an extra ½ day to buy the tickets and the risk of being alone. In the end we were happy with the deal. When we bought our tickets we were given a small sheet of paper that said “Rodrigo, meet at VAMOS at 4:30″ and his BsAs cell phone number. We waited and waited until finally a guy starts hollering at us from his black car. We climb in to find out that he is going to catch the bus that we are supposed to be on. He drove through the whole city with the phone glued to his ear weaving in and out of traffic. Between phone calls he tells us about the best team in the world – River Plate (pronounced “Reeber Playt”). 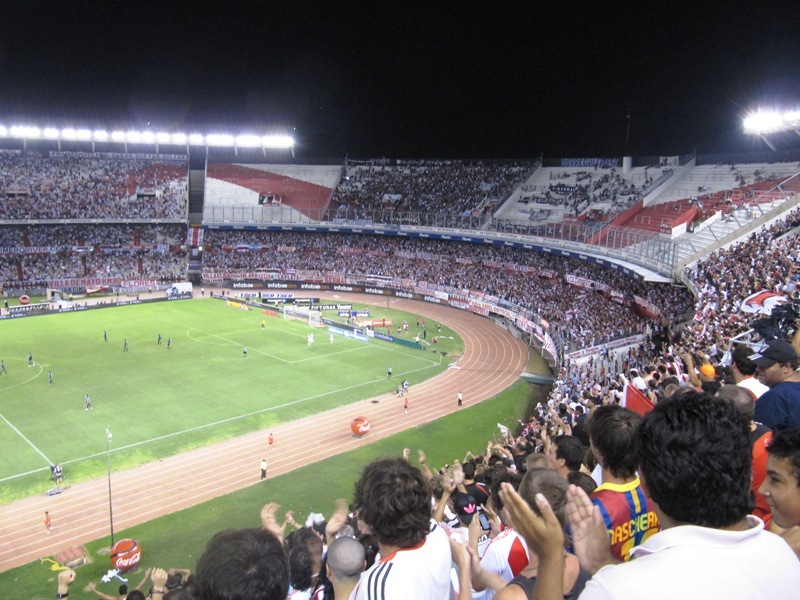 There is a huge rivalry between two all-star BsAs teams – River Plate and the Boca Juniors. This rivalry is similar to, but more vicious than, that of the Cubs and White Sox. River Plate is part of the richer north and Boca is in the working class south. There are constant arguments over who is the best. River Plate fans have a tough time winning that debate these days. Six months ago, River placed on the bottom of the bracket for the season and they were demoted to the B level league. The fans were so upset that they rioted the stadium during the final game and the rioting continued for several days. They are still pissed and the only way for them to redeem their shame is for their team to win the B level championships allowing them to return to the premier league. 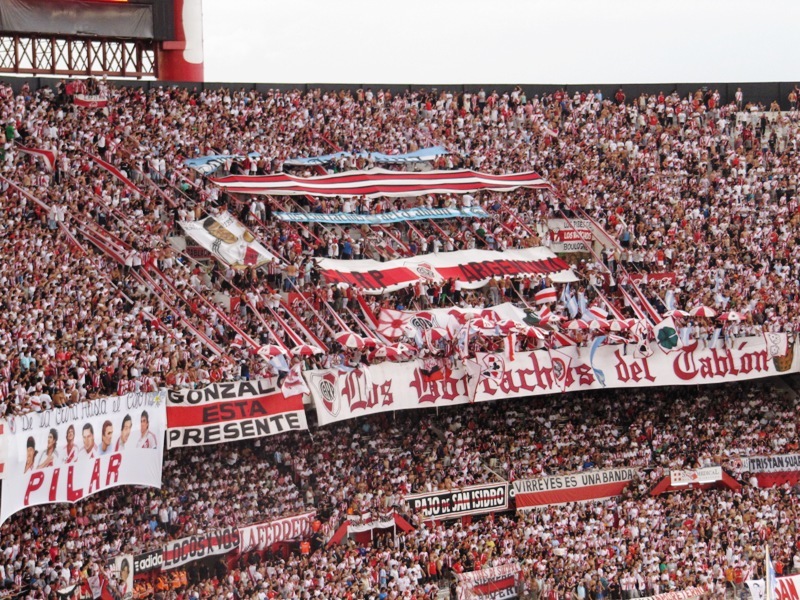 Lately the River Plate has some reorganized management and is doing very well. They placed 2nd place at the mid-year championship. But to all those fans with CARP (meaning Club Atletico River Plate) tattooed on their bodies winning is everything. Rodrigo bounced around the city until we met up with who he called the head River Plate hooligan. His mom gave him a stack of tickets and cash wrapped in a rubber band and waved eagerly to us as we drove away. At the stadium we found the bus group that included a broad collection of people from around the world, all of them booked with Rodrigo through their hostels. It felt like there we were 40 tourists and 40,000 jersey wearing fans set to go see a soccer game. 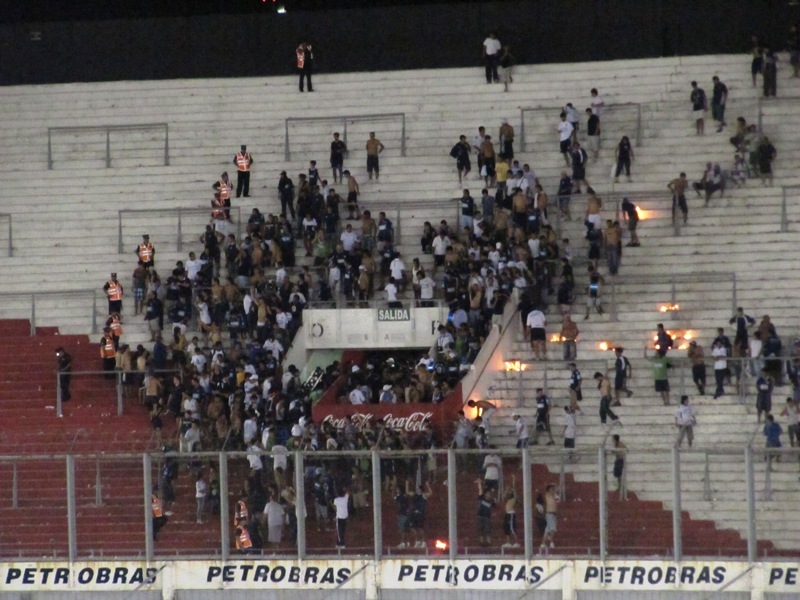 Argentina continues to increase the safety in the stadiums. Laws have become so strict that alcohol is not sold in the stadium and no drinks are allowed to be brought inside. At the first security gate the men and women were separated and we worked our way through the security check. After the first checkpoint we lined up again for ticket checks and another round of security pat-downs. These were not single-file lines, but hordes of people pushing and prying to get into the stadium. It was here that I was happy to have a guide. Our tickets showed no sign of where our seats were. Although we entered in gate “Q” there was no reference on the ticket or the stadium of where gate “Q” went. Of course my ticket machine broke right as I came to it. After some jostling and pushing I too was climbing the stairs to the upper deck. We found out that the seating was more or less open seating (reason why it’s not on the ticket). Our seats were phenomenal, mid-field with clear views of everything n the pitch. To the left of our seats was the standing room only section that included a raucous band, fifty or so banners, flags that were too many to count and a tumultuous crown of red and white. 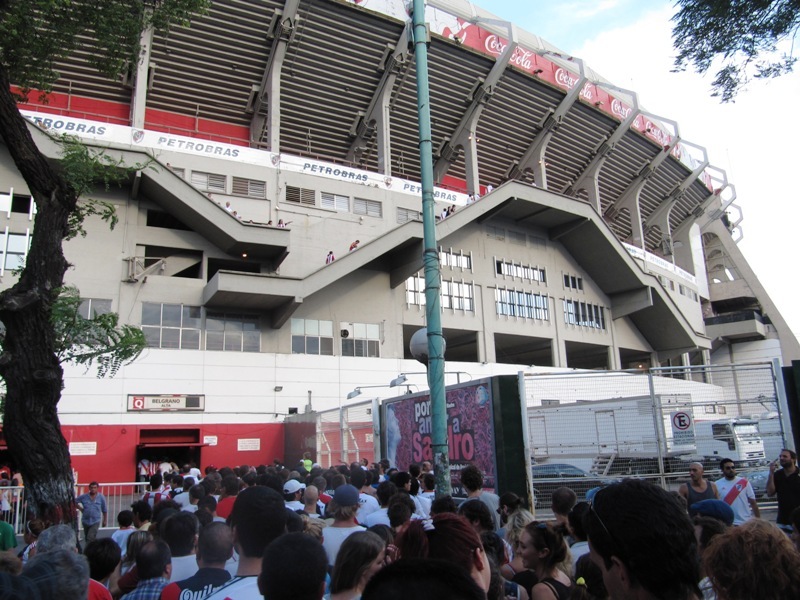 To the right was a small section dedicated to the opposing team, the Mendoza Independiente. This section was surrounded by heavy duty fences topped with barbed wire and an 8ft gap to prevent any interaction between the two teams. This gap was further patrolled by ten riot-geared police officers just in case. I was really hoping that the River Plate team won this game. 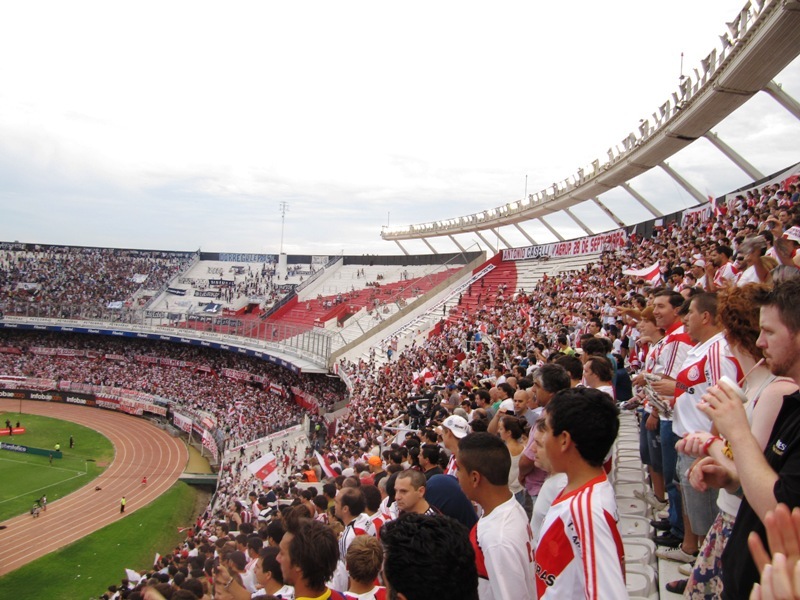 The game started out with some friendly banter and cheering by the Independiente fans then the fierce roar of River Plate fans echoed through the stadiumwith numerous other chants and song. The game played with some drama in the air, moments of silence, then a song, then deep gasps when the River team missed a shot. It was when a goal was made that things got really crazy. Upon scoring fans hugged everyone. A hug to each friend, then a neighbor, then a group hug. In a game where often only one point is scored it is very important to get on the board. The course of the game was pretty tame overall, there were few bad calls and the stadium only broke out once in a chant of “hijo de puta” at the ref that gave one of the River players a yellow card. The end result: River Plate – 3 and Independiente – 0. This of course put the Mendoza players in a foul mood. They started 10 or so fires in their section. To prevent any violent interaction between the fans, the opposing team gets some what of a head start to leave the stadium. 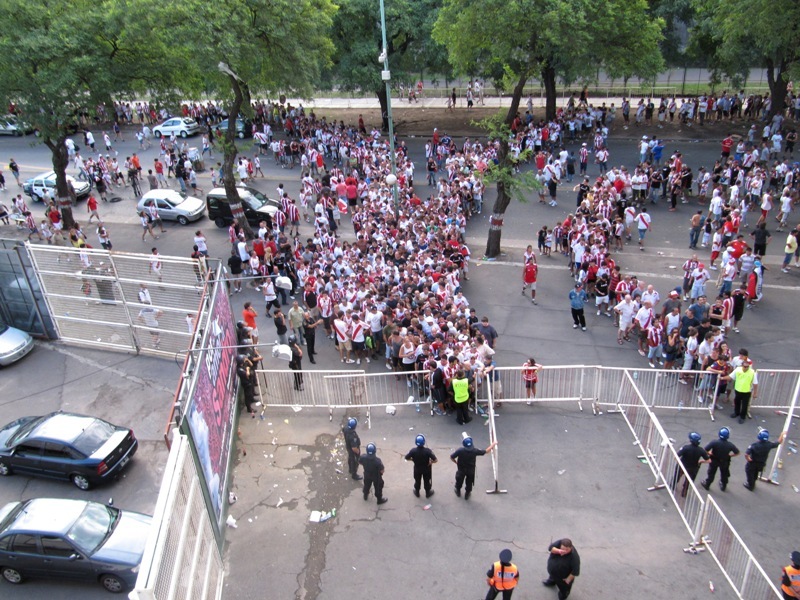 We waited 30 minutes after the game ended for the Independiente fans to clear the stadium. Leaving the stadium, we jumped in a private bus to return to the city. The public colectivo busses were crammed solid with cheering and singing fans. This looked fun, but what about when River looses? With a drop off in central we grabbed some food at an historic but unremarkable German beer hall without any German beers! Then we walked over to the local murga, a carnaval street parade with lots of music, dancing and crazy foam that the children and teens spray onto each other and everyone around. All in all, this was one busy day. I met you at the Iguassu hostel this week – hope you’re enjoying the falls! Do you have any contact details for the guy you booked the football match with? Hi Sarah, we actually went through our school, Vamos Spanish Academy. They work with this guy named Rodrigo who organizes everything. I no longer have Rodrigo’s number but if you contact Kat or Ingrid at Vamos I’m sure they would be happy to give you his info. Their email is info@vamospanish.com. I know that a few local hostels work with him too but unfortunately I don’t remember the names. Hope that helps!